Description.vsp is a Virtuoso Server Page (Virtuoso's equivalent of ASP) which provides a hypertext description of RDF Linked Data. Its purpose is to provide a default HTML rendering of RDF data, to allow it to be navigated using an HTML, rather than RDF, browser. Description.vsp underpins the 'Page Description' facility in the OpenLink Data Explorer (ODE) browser extension. (ODE is also available as a hosted service - e.g. http://demo.openlinksw.com/ode.) 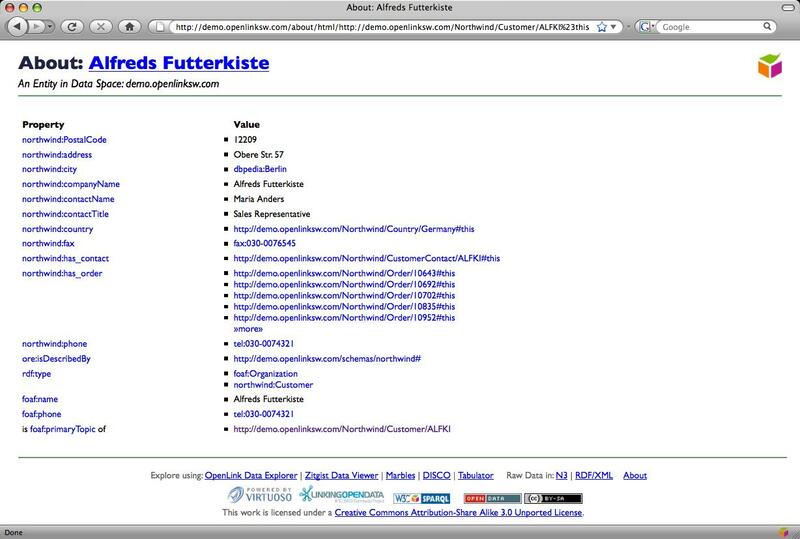 The HTML view it provides substitutes RDF hyperdata links with hypertext links. The description is tabular, listing the properties of the entity being described and, adjacent, the property values. Similarly, when deploying your own Linked Data, you can exploit the power of Virtuoso's URL rewriting to automatically redirect requests for HTML renditions of the RDF data to the /about/html proxy. If the source contains RDF directly, this is used 'as is'. If not, the Virtuoso Sponger extracts any available metadata through one or more Sponger cartridges and converts this to RDF. Data from the Northwind RDF view follows route 1. Data from the MusicBrainz? page on John Cale follows route 2. Whichever route is followed, the Sponger caches the RDF data in the Virtuoso RDF quad store. With the Northwind demo rewrite rule for HTML requests set up with a Request Path Pattern of /about/html/(. *) and a Destination Path Format of /rdfdesc/description.vsp?g=$U1 , a request for an HTML rendering of http://myhost/Northwind/Customer/ALFKI#this results in description.vsp being called with parameter g set to http://myhost/Northwind/Customer/ALFKI#this. description.vsp uses Virtuoso's SPARQL extensions for IRI dereferencing (see the Virtuoso on-line documentation: IRI Dereferencing for FROM clauses ) to invoke the Sponger via the get:soft "soft" option and crawl the URI identified by 'g'. e.g. The Sponger creates graph <http://myhost/Northwind/Customer/ALFKI> to hold the extracted RDF data describing entity ALFKI. Once cached in the quad store, description.vsp then issues a series of SPARQL queries to identify the predicates and predicate values associated with all RDF statements having <http://myhost/Northwind/Customer/ALFKI#this> as the subject. These are then displayed in an HTML table.